Blogging has become a "must" for many independent and fee-only financial advisors seeking to attract and retain clients. But many financial bloggers flunk the most important test: They don’t write reader-focused posts. Harnessing the power of "you, the reader" will boost your readership. In this webinar, you'll learn how to analyze your readers and their WIIFM (what's in it for me) as well as an easy-to-follow formula for outlining blog posts that snare readers. The average reader spends only 96 seconds reading a blog post, according to ProBlogger. If you want your readers to stick around, sign up today for this webinar! 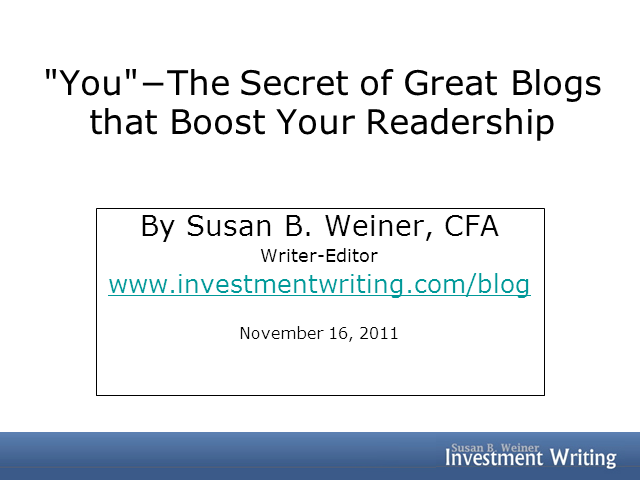 Susan Weiner, CFA, teaches the highly regarded "How to Write Blog Posts People Will Read" class for financial advisors. Her Investment Writing blog (http://investmentwriting.com/blog/) is popular with advisors who care about writing that deepens their connections with clients and prospects.